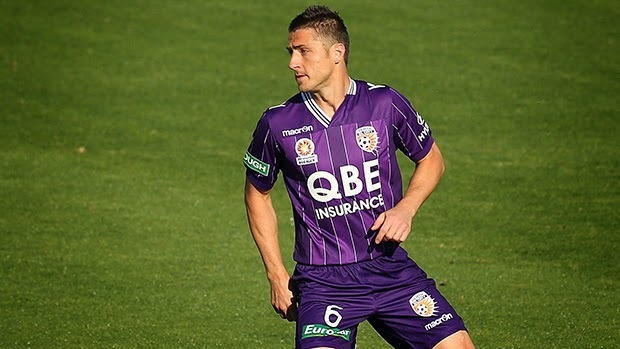 Perth Glory defender Dino Djulbic is adamant the club won’t be dwelling on the negatives despite being handed a brutal schedule ahead of Tuesday night’s Westfield FFA Cup semi-final against Bentleigh Greens. Searching for their first piece of silverware since their NSL ‘glory’ days, Kenny Lowe’s side have just 48 hours to recover from Sunday’s clash on the Central Coast before facing Victorian PS4 NPL side the Greens. Adding to Glory’s issues when they face the Green Machine, Glory will also be without key players Mitch Nichols and Jamie Maclaren who are on Socceroos and Olyroos duties respectively. Djulbic, though, was determined to see a silver lining in it all. “Listen, I think for me personally I took a positive out of it,” said Djulbic on Perth radio station SportFM on Thursday morning. “We were supposed to play on Wednesday I think, so we know we’re playing Tuesday and now we have a bit more rest for the Western Sydney game (the next weekend). I’ll take it that way. “I mean it is a tough schedule again for us but we’ve just got to go and roll with it and us as players, we just have to focus on the game and try to eat healthy and get the massages in and just go through this week again. “Obviously this is not an A-League side, which can’t be taken lightly, but I’m sure there’s going to be some changes. Last Saturday the Glory had to rely on a late double from Maclaren to edge out Newcastle 2-1 at nib Stadium after boom recruit Andy Keogh was kept in check by the Jets’ defence. Djulbic, though, believes the Irishman’s influence still played a part in Maclaren’s late heroics. “I think Andy has been a massive influence on him,” said Djulbic. “I spoke to Jamie just before the season started and he said he’s been watching him (Keogh) at training and all the games and how he works and how he finishes and he’s been such a big influence. "I mean they go to lunch together and everything. “Compared to last year he (Maclaren) was carrying a little bit of weight last year and he trimmed down and the confidence that Kenny has given him as well has helped him a lot.